I am going to come right out and say this: I like knitting much more than crochet. Now, please, dear Readers, hold off on the lynch mobs. I’ve seen tons of beautiful crochet, and I’ve also seen tons of horrid knitting. And, back in the day, I dabbled in crochet myself, even once making a beautiful filigree blouse in fine white cotton. It must be said, however, that both aesthetically and as a creative process, I prefer knitting. A few months ago, when I had the very good fortune to go to the Headquarters of Rowan Yarns in Holmsfirth (you can read about it here), I was given a goodie bag. In that goodie bag was a new pattern collection by the fabulous Marie Wallin, called Filigree, Collection 3, subtitled “10 crochet designs for women by Marie Wallin”. Five of these designs are made by combining knitting with crochet. And I mean this not in the sense that I normally see, in which a knitted sweater has a crocheted edging, but rather in the sense that for each of these patterns, both knitting and crochet feature as a design element. The combination of the two modalities is an intrinsic part of the pattern. And I have to tell you, these designs are gorgeous! I love how this is so crisp and sharp but still girly and pretty. Regular readers will know that I have a thing for patterns that are architectural – as soon as I saw this pattern I thought about iron filigree bridges. 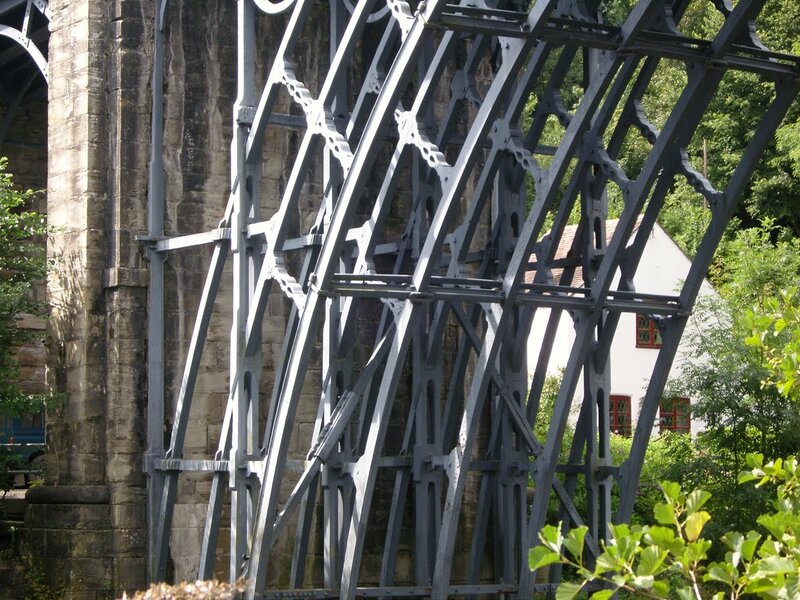 This is a photo of the Iron Bridge at Coalbrookdale, which was built in 1779 and is “the oldest surviving cast iron bridge in the world.” The photo and quote come from a post from the blog The Happy Pontist: A blog from the UK about Bridges and Bridge Design. I have only read this one post, but you can bet that I will be giving this blog a serious look. Many years ago, I used to work on Wall Street and live in Brooklyn and I would walk across the Brooklyn Bridge to get to work. I just love a beautifully designed bridge. Is it just me or can you see this too? Buttercup is, well, buttercup-y – all soft and flowery, but Anemone is sharp and edgy with hard edges, but incorporated into a soft package. I love it. 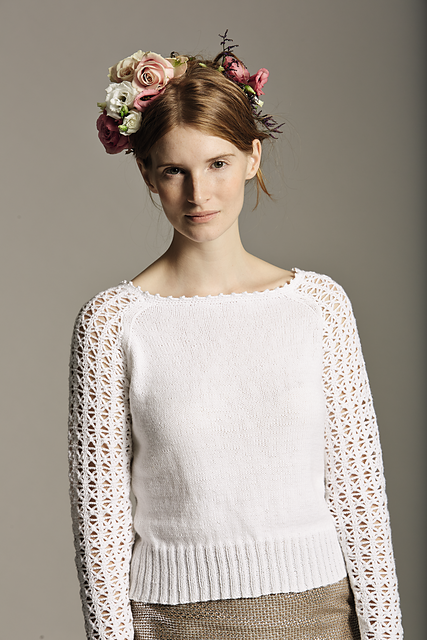 Designed by Marie Wallin using our beautiful soft matt cotton yarn Summerlite 4ply (cotton), the main section of this top is knitted in a cable and lace stitch with an unusual welt section made up of double crochet strips. If you can, zoom in on the crocheted section. It is really a cool design. The design makes me think of a modern, crisp take on a 1920s flapper dress. I love these patterns. In fact, I love them enough to overcome my crochet bias. I am thinking that only the amazing Marie Wallin could do that! My two great hobbies in life are knitting and reading (probably not in that order). 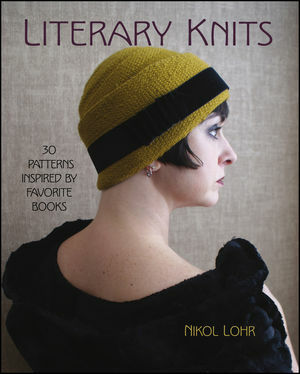 When I heard that Nikol Lohr had written a book called “Literary Knits: 30 patterns inspired by favorite books”, I knew I would like it. Nikol is the designer of the Carnaby Skirt, which I blogged about here. Carnaby is an excellent pattern. I probably would have bought Nikol’s book even without it’s literary references. Then, I began to read some reviews and see some of the designs, and this went right to the top of my must-buy list. If you follow these sorts of things, you can hardly not have noticed some of the most-talked about designs from the book. The Daisy Cloche, which Nikol wears on the cover, is one of them. Designed, of course, for Daisy from The Great Gatsby, it is not only fabulous but also completely Daisy, if you know what I mean. 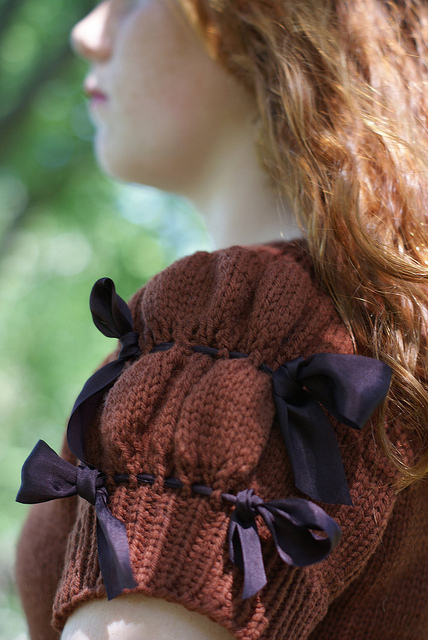 Other designs, which I’ve seen discussed all over Ravelry and the internet, include the Lyra Hood (from The Golden Compass), the Elizabeth Bennet Summer Blouse (Pride and Prejudice), the Gregor Sweater (The Metamorphosis), and the Edmund Crown (The Lion, The Witch and The Wardrobe). These are all amazing, in particular Lyra’s Hood and Gregor’s sweater (the latter which can only be described as Kafka-esque). I don’t want to post photos of every pattern here. Please, go see them. (Here is a Ravelry link to the book, which includes photos of all the patterns; or run a search for the pattern on the internet.) Better yet, buy the book. I’m not even that much of a shawl person; but I love this shawl. Even more I love its inspiration. Nikol based this on a memory from One Hundred Years of Solitude. She writes “I very distinctly remembered Remedios the Beauty ascending through a hole in the bathroom roof after her bath, surrounded and carried off by a cloud of yellow butterflies.” She was then surprised, on re-reading the book, to realize that this memory is false: she had somehow combined a number of beautiful images from the book in her mind, and created this visual memory. Before I switched to linguistics, I was a Latin American Area Studies major at Barnard College, and I spent a few years awash in magical realism. 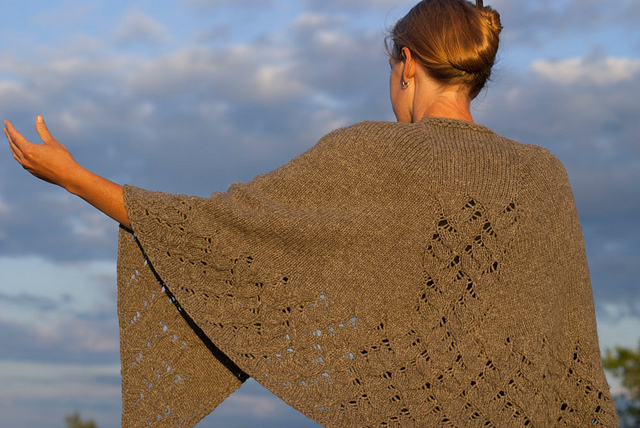 Nikol writes: “I’ve unravelled my misrememberance to produce an airy butterfly eyelet shawl.” I think her description of how she unwittingly combined bits of the story and created a visual memory, and then used it to design this shawl, is a homage to the whole concept of magical realism. I love it. Not only that, but the shawl is lovely. I love this. And I love it in a totally different way from the Meme Shawl. This shawl is plain. It is plain in a way that is distinctly beautiful, just like Shaker furniture is beautiful. 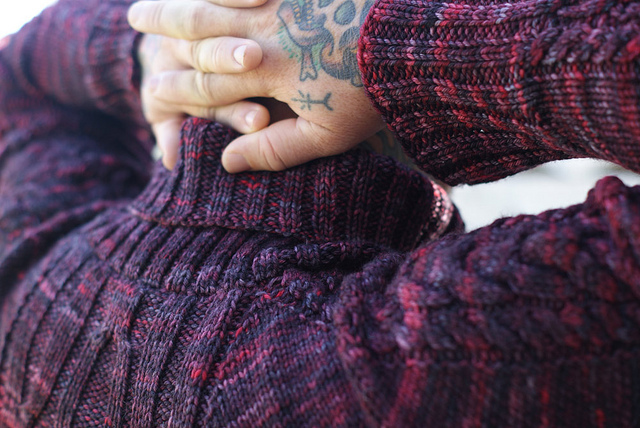 It has great shaping details around the shoulders, based on Faroese designs, and a pretty lace pattern, but the thing that makes it beautiful is its simplicity. This shawl is for lovers of wool; real wool, unadorned, undyed. It is practical, warm, strong, and has endurance. 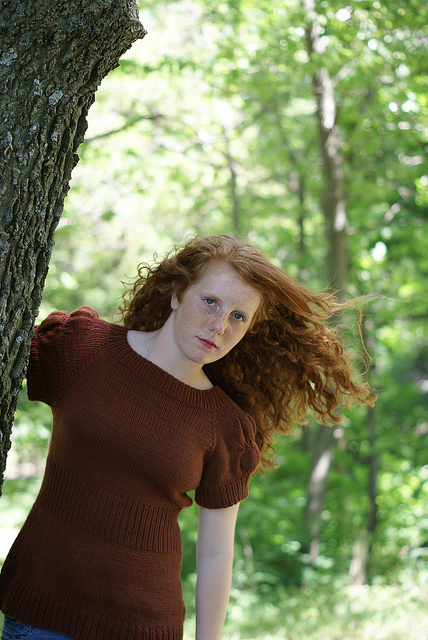 Where the Meme shawl is ethereal, the Jane Eyre shawl is earthy. One of my absolute favorite characters in literature is Anne Shirley. I spent countless hours as a child curled up with Anne, and many years later, I spent countless hours curled up with Emma and Leah, reading her adventures out loud. When I told Leah that there was a design in this book based on the dress Matthew gave Anne, her first comment was “You mean the brown one with the puffed sleeves?” No lover of Anne could forget that dress. 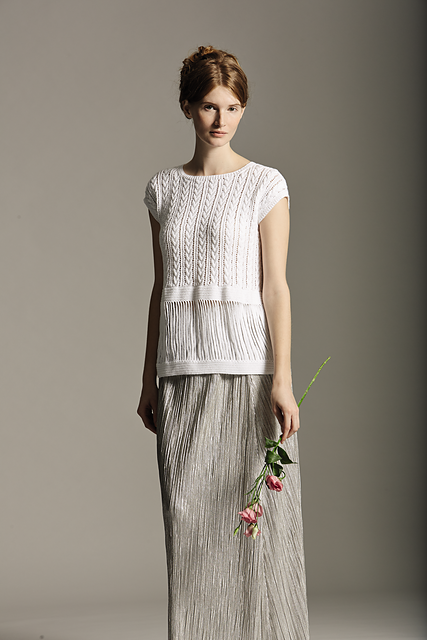 Nikol has made it into a top (which could easily be converted into a dress by most any knitter of adequate skill). It also has very cool and unusual shaping details in the shoulders, which you can just make out in the photo above. I love the model as well, who does not resemble the ubiquitous male sweater model. 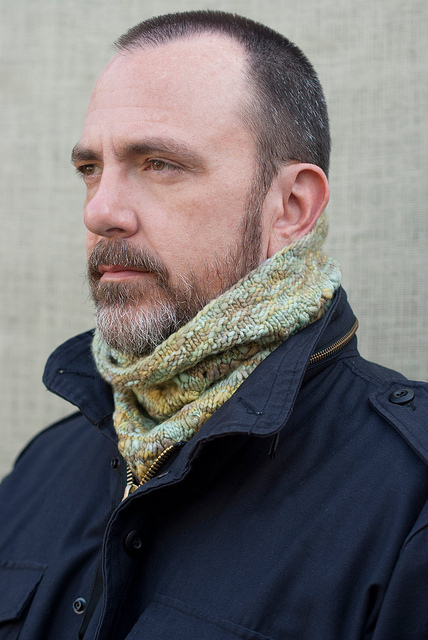 I will end by showing the Sydney Carton Cowl from a Tale of Two Cities. I will admit that, by simply looking at this photo, you might not think this cowl to be particularly fabulous. However, just like Madame Defarge’s knitting, this cowl is knitted with a secret code. Nikol has created a knitted version of Morse code, and then knitted a message into the cowl. She has included two versions – with evocative quotes for Madame Defarge and for Sydney Carton. The former says “Madame Defarge knitted with nimble fingers and steady eyebrows and saw nothing.” I am enough of a nerd to think this is completely awesome. I love this! I have never met Nikol Lohr and am unlikely ever to do so. But this book makes me think I’d like her. If you are like me, and the first thing you want to do when entering someone’s house is to look at their bookshelves, you’d probably get a kick out of this book too.